A total of 21 players competed for The Christmas Individual Stableford played on Boxing Day. The beautiful Indiana Course was bathed in sunshine under powder blue skies all day long. 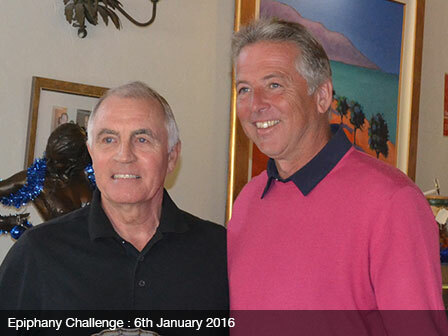 Stuart Baynham took out the festive victory with a score of 33 points, from runner-up Ray Charles on 32 points. A great field of 39 players competed for The Constitution Cup on the beautiful Indiana Course with glorious weather conditions which were enjoyed by all. There was some very good scoring on the day. An extremely close finish was seen in the Mens Event, with Alan Hewitt victorious after a round of 81 (Low Handicap), from Patrick Sweeney and Freddie Beames. For the Ladies, Liz Shutlar was crowned Champion with a round of 85, from runner-up Jaki White. The prize giving ceremony took place on The Deck and was hosted on behalf of the Competition Committee by Barry White. The Presidents Cup brought to an end a very busy period of tournament golf at Desert Springs. Another fantastic field of 46 players entered the event held on the beautiful Indiana Course under powder blue skies. 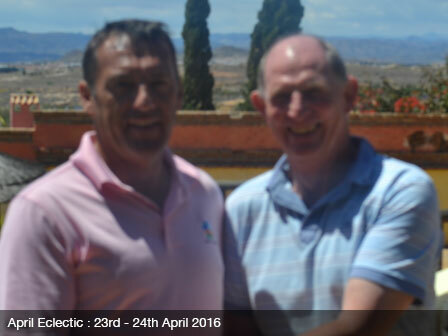 Club Captain Martin McLellan proved a very popular winner and was crowned champion with a score of 38 points. David Garnett took the runners-up position with 36 points, followed by Graham Cook, David Hadden, Freddie Beames, and Roger Butters, who all scored 35 points. The prize presentation was held on The Deck and was hosted by Club Captain Martin McLellan and Committee member David Hadden. The Club Handicap Salver was held over two days on a glorious sunny last weekend of October. A fantastic field of 47 players entered the event on the beautiful Indiana Course and which was played under medal conditions. An extremely close finish was seen in the Men´s event with two players going shot for shot for the title. There had to be a winner though with Mike Thorpe prevailing with a combined score of 144, only beating Charlie McKinnes by virtue of lower handicap. Third place went to Stuart Baynham on 148. 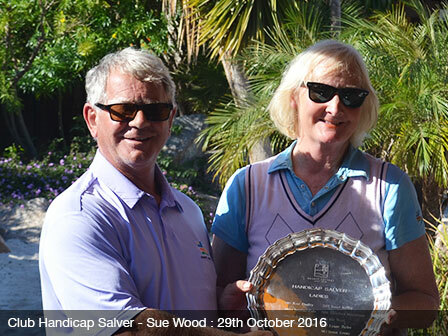 For the Ladies, Sue Wood repeated her success of 2011 and was crowned champion for a second time with a score of 152, from runner-up Brenda Clark-Whittle on 154, and Jaki White in third on 161. The prize presentation was held on The Deck and was hosted by Committee members Barry White and David Hadden. A fantastic field of 51 players teed it up for The Past Captain´s Team Challenge the morning after the festivities of The Captain´s Charity Day celebrations the night before. A stunning morning greeted the players for the event held on the beautiful Indiana Course. 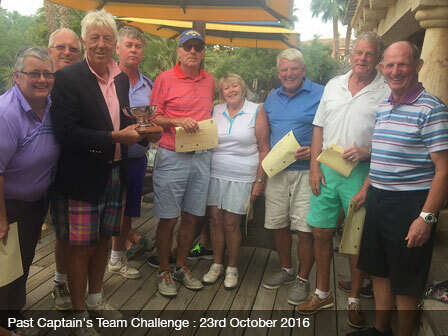 'Team Beames' comprising of past captain Freddie Beames, John Crosby, Paul Taylor, Jim Kendall, Michael Nielan, Nicola Iles, Patrick Wood, Ian Tomlinson, and Sylvia Howard took home the honours for the day. 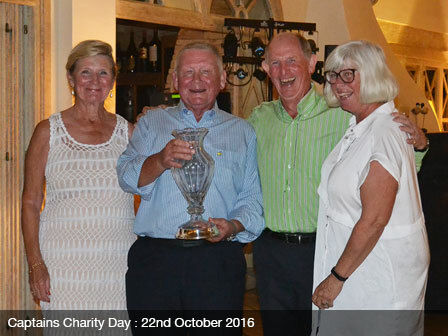 Club Captain for 2016 Martin McLellan hosted his Charity Day on a gorgeous day in late October. The stage was set for 24 Teams of four to compete in a Waltz Tournament on the beautiful Indiana Course. The team of Zoe Griffiths, Elizabeth Bielby, and Chris and Elaine Robinson were crowned Charity Day Champions, followed by Kirby and Sue Garrod, Karen Nicholls, and Jayne Errington in second place, with Freddie Beames, Wikkie De Graaf, and John and Yvonne Morrison in third. The prize presentation was held as celebrations went long into the night in El Torrente and was hosted by Club Captain Martin McLellan. The Indiana Course at Desert Springs hosted The Autumn Trophy competition with perfect playing conditions and sensational weather. 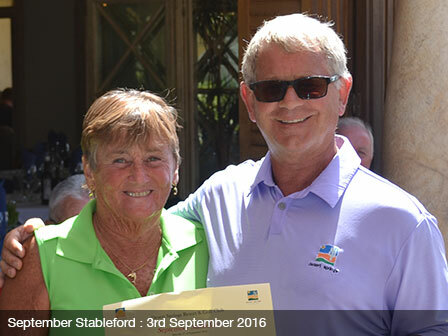 A fantastic field of 57 players took part in this Individual Stableford competition in their quest to be the Champion. Lee Coxon put together a wonderful round of golf to win the event with a score of 42 points, followed by Duncan Boston with 38 points. 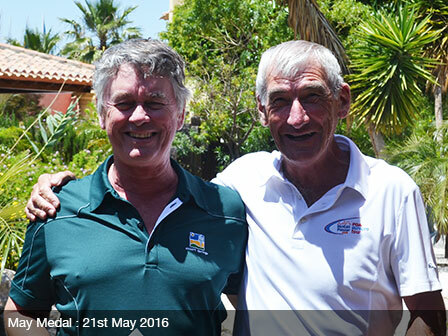 Martin McLellan and Ken Taylor shared third position with 36 points. The prize presentation took place on The Deck and was hosted by Club Captain, Martin McLellan. The Desert Classic Tournament is played over two rounds of the beautiful Indiana Course in October each year. This year’s renewal had a field of 31 players competing in stunning conditions trying to be crowned The Desert Classic Champion Golfer. Lots of stories were heard throughout the weekend with everyone having a wonderful time, a special mention to Elaine Gray who recorded a Hole-in-One on the 14th Hole on Saturday. Duncan Boston was victorious with a combined total score of 72 points over the two days, second place went to Alan Patterson, by virtue of lower handicap, with 68 points, with third place going to Stuart Baynham. A field of 20 players enjoyed a beautiful sunny day on the always challenging Indiana Course. The perfect temperature of 27ºC combined with the beautiful conditions of the Indiana Course provided a great stage in which the players battled to win the September Medal Competition. Freddie Beames and Paul Taylor tied in first place with 70 net shots, however, Paul Taylor would take the win in virtue of lower handicap. 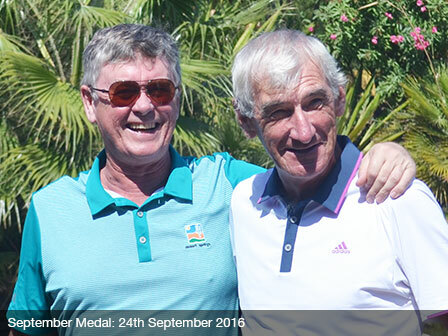 Tied for third place with 71 net shots were Barry White and Past Captain Richard Fuller. The prize presentation took place at the Deck and was hosted by Committee Member Barry White. 18 pairs took to the Indiana Course in beautiful playing conditions for the annual September Greensomes. The format ensures lots of tactical thinking, with plenty of discussions taking place between pairings trying to plot their way around to try and become Champions. The all-Lady pairing of Dee Tomlinson and Jacqueline Burns put together a fantastic round to score 41 points and secure victory. They were closely followed by the pairings of Barry and Jaki White, and Dennis Stafford and Ray Charles, who both scored 39 points. 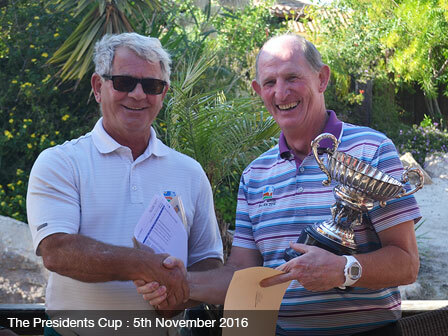 The prize presentation took place on The Deck at the Clubhouse and was hosted by Barry White on behalf of the Competitions Committee. The prize presentation was held at the Deck and hosted by Committee Members Barry White and David Hadden. 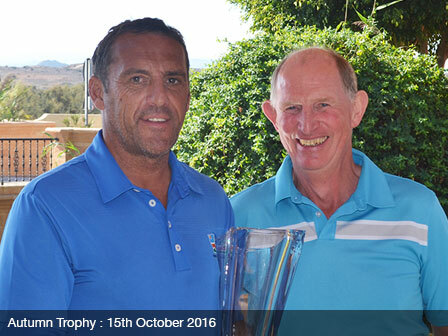 A total of 21 players gathered at Desert Springs to compete for the August Stableford Trophy. The sunny sky and beautiful conditions of the golf course provided a warm welcome to the players, which took advantage of such conditions to post some great scores. Liam McKinnes played a superb round of golf, scoring 39 points, followed by Andrew Markham and Harry McKinnes, with 37 and 36 points respectively. The prize presentation was held on the Deck at the Clubhouse and hosted by Committee Member Barry White. The Indiana Course played host to the annual Summer Challenge Cup, gathering a great field of 31 players competing in this 18 hole Stableford Competition. A stunning summers day greeted all competitors for the challenge that lay ahead. The course played beautifully and the scoring certainly backed that up with some fantastic scorecards being handed in. Harry McKinnes held the cup aloft with a sensational score of 42 points, second place went to David Matthewson with 41 points, and third place kept it a family affair, with Charlie McKinnes on 40 points. 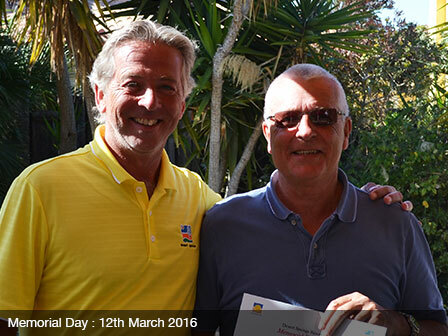 A special mention goes to Fernando Pertierra Pastor who recorded a hole-in-one on the 2nd. Thank you to all competitors for a wonderful day of golf. The prize presentation took place on The Deck at the Clubhouse and was hosted by Richard Fuller on behalf of the Competitions Committee. The Indiana Course again played host to the annual Professionals Challenge Cup. The event is played between the Desert Springs Golf Professionals up against a field of member’s and guests pairs, who compete on a Fourball Better Ball format. This year, a total of 14 pairs enjoyed the fantastic conditions of the Indiana Course at Desert Springs on a beautiful summers day, playing some great golf which was proved by the low scoring, leading to a very impressive leaderboard. Desert Springs Golf Professional Alfonso Castineira set the target of 40 points to beat. Four pairs were able to better that score this year. In fourth place with 41 points were John Wardley and Zoe Griffiths, third place went to the two brothers, Harry and Liam McKinnes with 42 ponts, with second place going to Father and son, Wayne and Mason Hancock who scored 43 points. The winners of the event however, with a sensational score of 48 points, were David Smith and Phil Angus. Thank you to all participants on a great tournament. 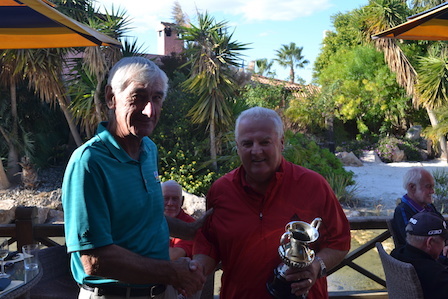 The prize presentation took place on The Deck and was hosted by Competitions Committee Member Barry White, and Desert Springs Golf Professional Alfonso Castineira, who presented the trophy to the winning team, as well as the prizes for all pairs who were able to claim that for 2016, ‘We beat the Pro’. The Desert Springs Med-Ford is a unique competition of two different formats in one round of golf. The front 9 holes are played as Medal play with the back 9 played as a stableford. 30 players entered the event on the beautiful Indiana Course played in glorious weather. James Humphrys was the winner, followed by runner-up Jaki White, and then Duncan Boston and Sandra Edwards. The prize giving ceremony took place on the Deck and was hosted by Barry White on behalf of the Competition Committee. 24 players took to the The Indiana Course for the July Medal. 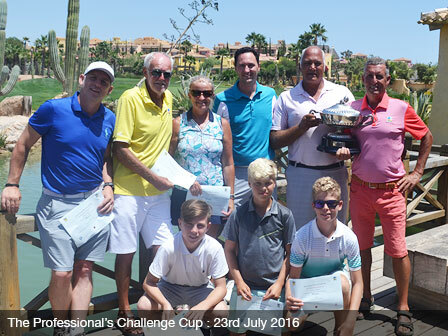 The course was presented impeccably and the tournament was played in simply glorious weather. 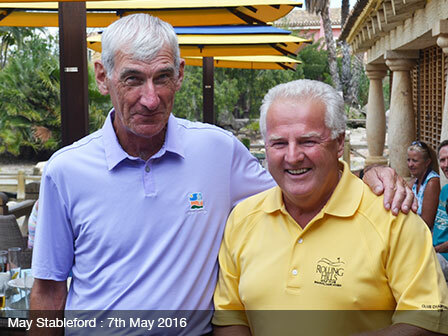 Stuart Baynham won the event with a Nett 68 from Dennis Stafford in second with a Nett 69. The prize giving ceremony took place on the Deck and was hosted by David Hadden on behalf of the Competition Committee. 27 players teed it up on the The Indiana Course for the June Stableford. 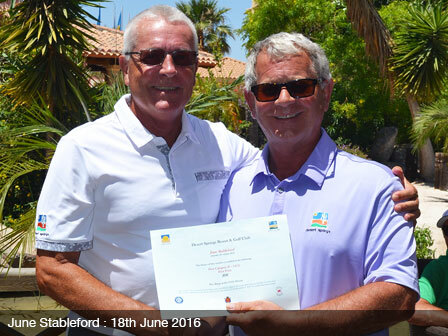 The course was presented in fantastic condition and the sun shone down all day for everyone. 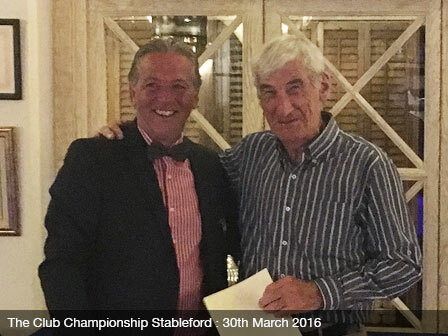 Dennis Stafford was victorious with 40 points, by virtue of lower handicap, from John Haydon in second. 35 players took to the emerald fairways of The Indiana Course for the Director’s Trophy. Delightful weather conditions with 27ºC and blue skies ensured a memorable golfing day on the Indiana Course, which was presented in beautiful conditions. Roger butters was victorious with 39 points in virtue of lower handicap. 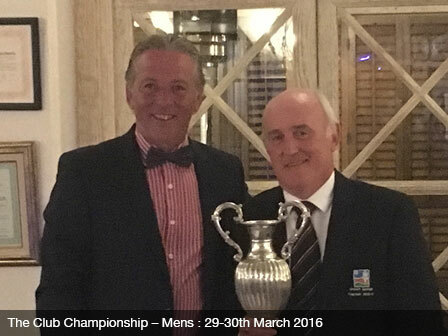 Club Captain Martin McLellan finished runner up also with 39 points, followed by James Botham with 38 points. 25 players took to the pristine fairways of The Indiana Course for the May Medal. Glorious sunshine played out all day long which ensured lots of happy golfers. Paul Taylor was victorious by 3 shots with a great round of Nett 69. 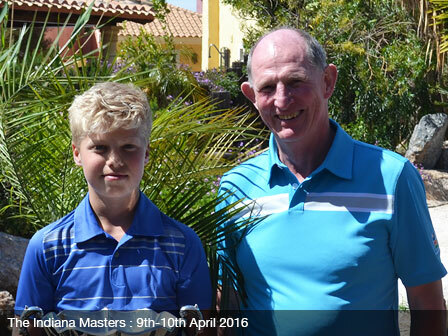 Freddie Beames was runner-up, by virtue of lower handicap, from Jaki White in third, after both scored a Nett 72. 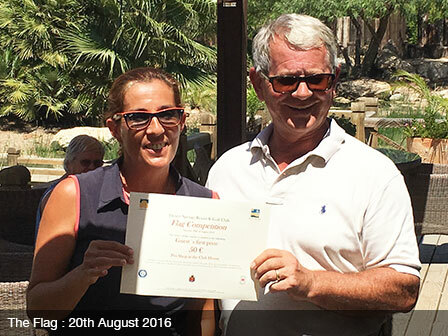 There was a fantastic entry of 22 pairs who took to The Indiana Course for the Open Pairs Tournament. The sun shone down and the course was presented beautifully for the event. 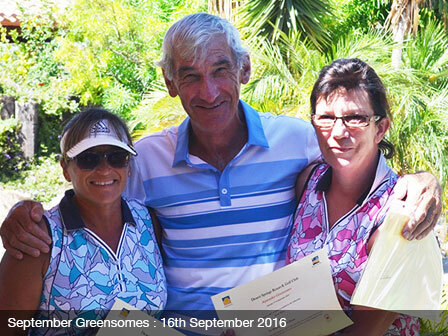 The pairing of Andrew Markham and Sandra Edwards were victorious with a score of 38 points. 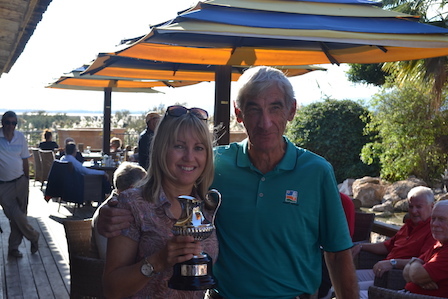 Roger Butters and John Crosby were runners-up, by virtue of lower handicap, from Jim and Linda Kendall in third, after both pairs scored 37 points. 21 players took to the fairways for the May Stableford. The Indiana Course was presented in beautiful condition on a glorious sunny day. Alan Hewitt won the event with a score of 38 points. 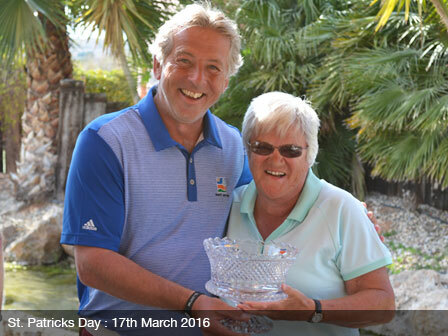 Barry White took second place by virtue of lower handicap from wife Jaki in third, after both scored 37 points. 14 players took part in the April Electric. A gorgeous sunny weekend ensured perfect playing conditions for both rounds on The Indiana Course which was presented in beautiful condition. The individual event was played under stableford scoring with the best score recorded on each hole over the two rounds to count towards the Eclectic score. Lee Coxon came out on top with a score of 47 points. Liam Dunphy took second place, (44 points), from Neil Halliday in third with 43 points. 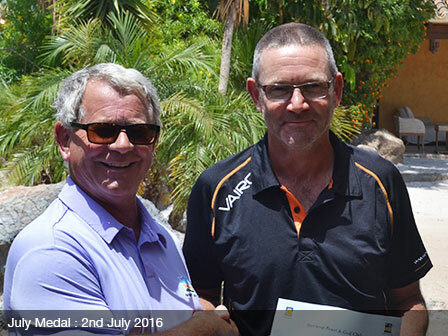 The prize giving ceremony took place in the Crocodile Club and was hosted by Club Captain Martin McLellan. After the success of the Captain’s Drive-In held on the 1st April, the Indiana Masters was next on the tournament calendar, which coincides with the US Masters at Augusta, and gathered a field of 36 players, striving to put their name on the Honours Board after competing in this 36 hole Stableford Competition. The Indiana Course was presented in fantastic condition for the two days and a new name was added to the illustrious list of past winners, with Liam McKinnes proving a very worthy champion with a combined score of 70. Charlie McKinnes made it a real family affair by claiming second with 68 points. 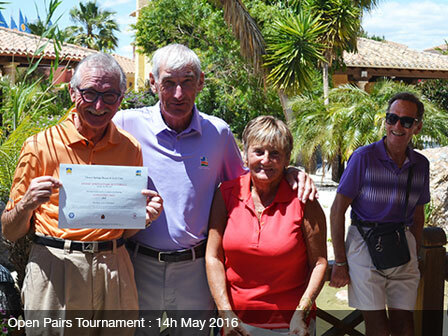 The prize presentation was held in El Torrente hosted by New Club Captain Martin McLellan. 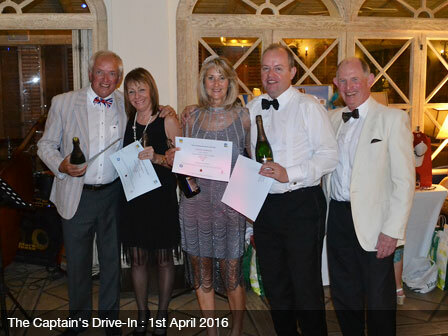 The 2016 Captain's Drive In took place on the April 1st, gathering 20 teams of 4 players, who competed in a Greensomes event with perfect weather conditions. The theme for this year was Gangsters and Molls, and contestants dressed up accordingly! The day began with a drinks reception at the unique Cave Bar, where 'mulligans' and flags were sold, the flags being offered to players who wanted to guess where the first drive of New Captain Martin McLellan would land. All the money collected would be sent to the Captain's Charity. After the competition, over 90 players and guests gathered in El Torrente Restaurant for a dinner and prize presentation. The winning team, formed by Ashley and Gina Roberts, and Martin and Nicky Vanstone, won with a score of 48 points, followed by The McKinnes Family, Hayden, Harry, Liam, and Charlie, and Jim and Linda Kendall playing with Paul and Lynne Taylor, both with 45 points. A fantastic day was had by all and a great welcome given to Desert Springs Club Captain Martin Mclellan to launch into his year! 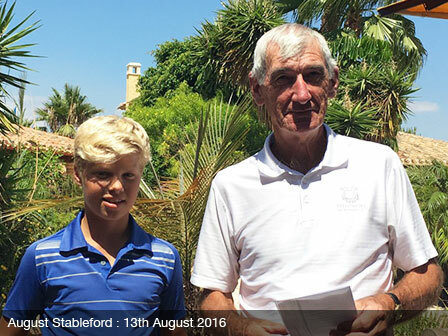 Alongside the second round of the Club Championship, the Club Championship Stableford gathered a total of 41 players, competing in an 18 hole stableford tournament. The winner of the event was Barry White with a total of 36 points (Low Handicap), from Charlie McKinnes. Third place went to Linda Kendall with 35. The prize presentation took place during the Club Championship Dinner, hosted by former and new Captain’s Richard Fuller and Martin McLellan. With Easter celebrated, it was time for the most important Club Competition to take place over a 2 round medal play format. The Club Championship crowns the Men’s and Ladies’ Champions, who must battle against the best players and produce the best gross score on the Challenging Indiana Course, played from the Championship Tees. Fast greens and demanding pin positions lay in wait for all those trying to become Club Champion! After round one, Mike Thorpe took the early lead in the Men’s Championship with 84 strokes, followed by David Garnett with 86 and Chris Cole with 88. 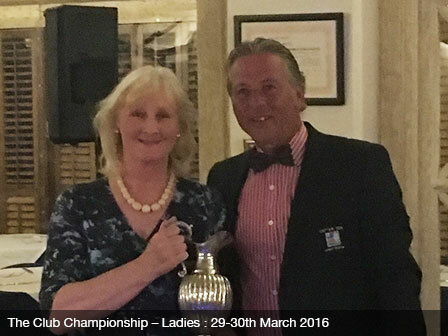 On the Ladies side, Sue Wood posted a 99 to be the overnight leader, followed by Jaki White with 100. In round two, the Men’s leaderboard took quite a few twists and turns throughout the morning with Richard Dunphy producing the round of the day to leapfrog all and be crowned Champion. Runners-up position went to Chris Cole, with David Garnett in third. On the Ladies side, Sue Wood continued her pillar to post victory with another solid round to take the spoils from Jaki White. Congratulations to both! Following on from the tournament, the Club Championship Dinner and the Prize Presentation, hosted by former and new Captain’s Richard Fuller and Martin McLellan was held in El Torrente. 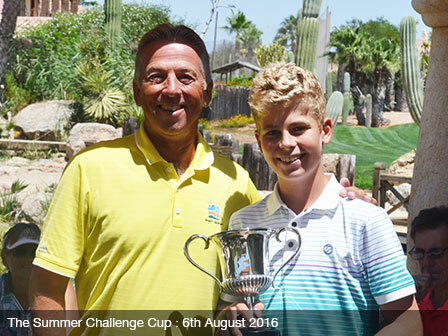 Desert Springs is always a hive of activity during the Easter period, organising events for the family, and the Easter Cup is a perfect example of an event with fantastic participation. 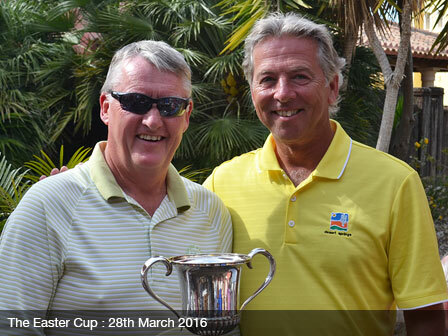 A total of 74 players competed in this year’s Easter Cup. The superb conditions of the Indiana Course and the beautiful weather ensured a wonderful day was had by all. Steve Gray was crowned champion with a score of 38 points, followed by Alan Hewitt, David Hadden, and Nicky Vanstone, all with 36 points. The prize presentation was held on the Deck and was hosted by Club Captain, Richard Fuller. 30 players teed it up on St Patrick’s Day, all with the ambition of wining the Bowl. A gorgeous sunny day ensured perfect playing conditions on The Indiana Course which was presented in beautiful condition. Cheers were heard ringing around the clubhouse when Jaki White was announced the champion with a score of 36 points. 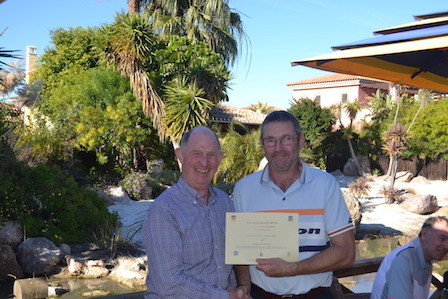 Steve Gray took second place, (35 points), by virtue of lower handicap, from Club Captain Richard Fuller. 32 players competed on Memorial Day. A beautiful warm sunny day ensured perfect playing conditions on The Indiana Course which was presented impeccably. 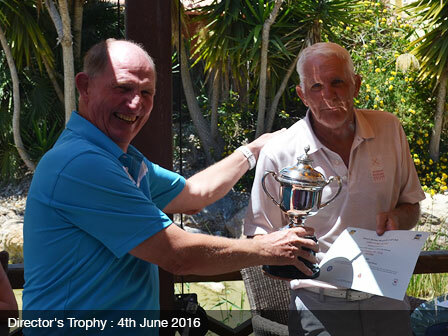 Dennis Stafford proved a very popular winner with a score of 36 points. Steve Gray took second place, (34 points), by virtue of lower handicap, from Alan Hewitt, Juan Lopez, and Phil Angus. A field of 21 took to the fairways for the Desert Springs Waltz. Cloudless sunny skies adorned The Indiana Course which was presented beautifully. Club Captain Richard Fuller teamed up with Freddie Beames, and Roger Butters to be crowned champions with a winning team score of 69 points. 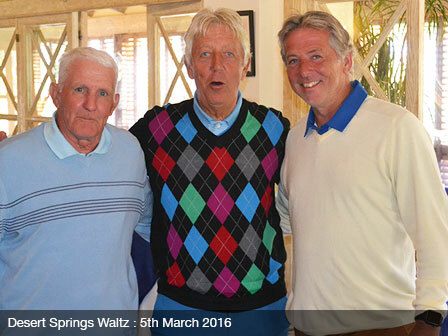 The team of Alan Hewitt, John Haydon, and David Hinton were runners-up with 67 points. The prize giving ceremony took place in the Clubhouse and was hosted by Club Captain Richard Fuller. 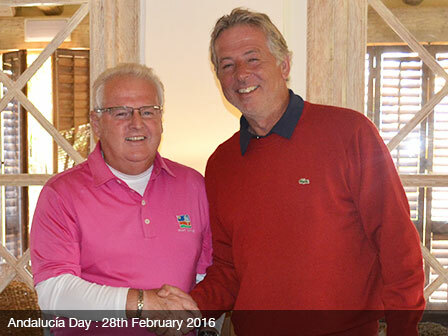 24 aspiring players teed it up for Andalucia Day. The Indiana Course was presented in beautiful condition. The tournament was played in fantastic spirits, with everyone enjoying a wonderful day. Alan Hewitt returned to the winners enclosure with a stableford score of 39 points, edging out Club Captain Richard Fuller by virtue of lower handicap. Third place went to Dee Tomlinson with 35 points. Nine teams competed in The Carnival Scramble which was played on a glorious sunny afternoon with The Indiana Course presented in fantastic condition. 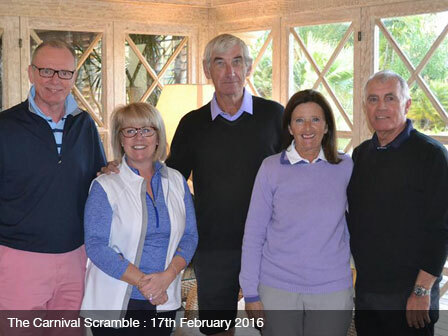 Carnival winners for 2016 were the team of Mike and Anne Thorpe, and Brian and Katrina Bradford with a great score of 59.7. Just missing out, and runners-up were Barry and Jaki White, Dennis Stafford, and David Smith with 60.2. 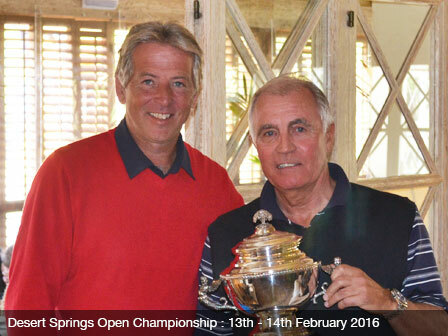 A total of 28 players competed for The Desert Springs Open Championship which was played over St Valentine’s Day weekend. The Indiana Course was presented in beautiful condition. The tournament was played in testing conditions with the wind blowing on both days. 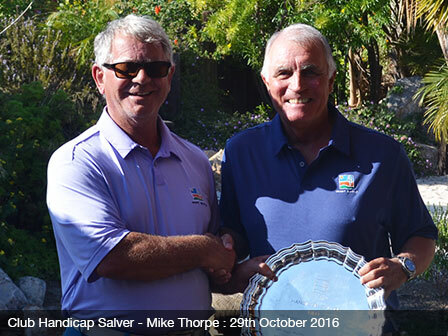 Mike Thorpe continued his current fine run of form to be crowned champion with a combined stableford score over the two days of 65 points, from Roger Butters (Low Handicap) with 64 points, and Kirby Garrod. A fantastic field of 46 players took to the first tee for the Epiphany Challenge which was held on Three Kings Day, the 6th January 2016. Powder blue skies adorned the Indiana Course which was presented in superb condition for the event. 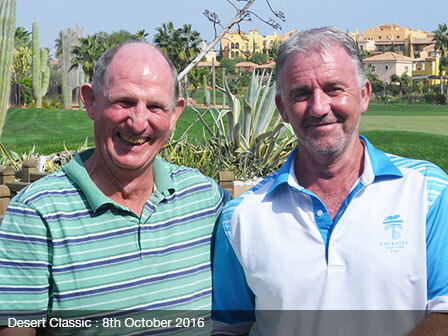 Two players were tied at the top of the leaderboard with 35 points, winning by virtue of lower handicap was Mike Thorpe, with Mark Newall runner-up. 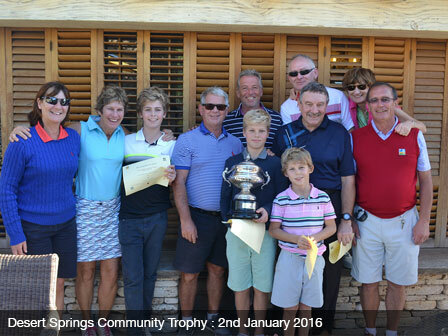 The Community Trophy is a team event held at Desert Springs where the respective communities of the resort compete in a stableford tournament to claim the title as the best Community in Golf. Echo Rock came out triumphant to be crowned winners of the first event of 2016. Congratulations to all players.